The UI’s newly archived papers from broadcast journalism legend Tom Brokaw provide a window into a half-century of world events. Tom Brokaw strolled through the UI Main Library’s Learning Commons this past January and waxed nostalgic. As Today show cameras rolled, the legendary newsman reminisced about his time in Iowa City, took photos with students, and dropped in on a class. Brokaw, a former UI student who received an honorary degree from the university in 2010, returned to campus to film a segment for NBC about the trove of material he donated to UI Libraries’ Special Collections. He spent the morning sharing stories from the thousands of history-steeped artifacts that make up The Papers of Tom Brokaw: A Life and Career, newly open for public research. Among the items are hand-written notes from President Ronald Reagan and filmmaker Steven Spielberg, stacks of reporter’s notebooks from trips to the Soviet Union and Middle East, and interviews for his best-selling book, The Greatest Generation. Joined by the Today show's Craig Melvin and an NBC camera crew, Tom Brokaw talks with UI students during his recent visit to Iowa City. For Brokaw (10LHD), finding a permanent home for his papers was less about preserving his legacy than providing students and scholars with a new lens to view some of the most pivotal moments of the last 50 years. His collection reflects the unique on-the-ground perspective of one of the nation’s most influential broadcast journalists who covered world-shifting events like Watergate and the fall of the Berlin Wall. A South Dakota native, Brokaw was a freshman in 1958-59 in Iowa City, where he had a great time but not a great year, as he puts it. He transferred as a sophomore to the University of South Dakota before breaking into the TV news business in Sioux City and Omaha. While he didn’t graduate from the UI, Brokaw has always held a fondness for the university and its library. It was here in the Main Library, he recalls, that he dug through the upstairs stacks researching Calamity Jane, the pioneers, and the history of his home state for class projects. So when the time came to find an institution to accommodate his substantial collection, the UI was a natural fit. Legendary anchorman Tom Brokaw explains his affinity for the UI, where he donated his collection of papers from 50 years in broadcast journalism. 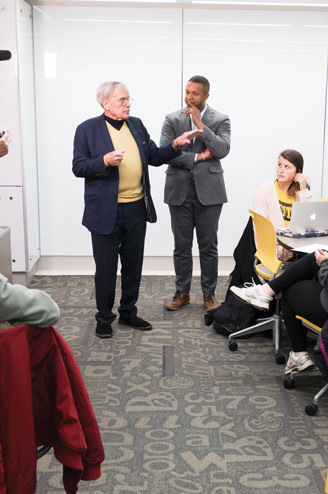 While filming the Today show piece, Brokaw made an impromptu visit to a class titled Race and Ethnicity in Sport, which meets in one of the library’s high-tech TILE classrooms. Brokaw joined in the discussion, sharing his thoughts on racial issues in sports today and challenging students to do the same. For Sydney Zatz and her classmates, it was an unexpected thrill. An exhibit featuring the newsman’s collection will open Sept. 7 in the Main Library Gallery. In the meantime, Iowa Alumni Magazine dug into Brokaw’s papers to find a few of the more notable items—as seen below. Brokaw began his television news career in 1960 at KTIV-TV in Sioux City, Iowa. Brokaw's student ID card from the 1958-59 academic year at the University of Iowa. A calendar page shows how Brokaw erased plans and penciled in a last-minute trip to cover the fall of the Berlin Wall on Nov. 9, 1989—a major scoop for Brokaw and NBC News. A note from Nancy Reagan congratulating Brokaw on his latest book. Inspired by the 1969 moon landing, Brokaw typed this poem while working at an NBC affiliate in Los Angeles. A map with notes from election night in 2004, signed by President George W. Bush. It reads: "To Tom. Our final dance. Thanks for your great service to our nation." A reporter's notebook from Brokaw's 2004 trip to Iraq before he departed as anchor of the NBC Nightly News later that year. A letter from actor Tom Hanks, a frequent correspondent with Brokaw, about their shared interest in preserving the stories of World War II veterans. Press passes for the 1976 Democratic National Convention in New York, where Brokaw was a member of NBC's team of floor reporters. Brokaw interviews Gorbachev at the 1985 Geneva Summit during the Cold War. Brokaw's copy of the White House transcripts published in 1974, months before President Richard Nixon's resignation. The Papers of Tom Brokaw: A Life and Career fills more than 90 boxes, and Elizabeth Riordan pored over every single paper and artifact—some more than once. The School of Library and Information Sciences graduate student from Des Moines spent the better part of the last year preparing the collection, which became accessible to the public Feb. 1. That a student would be put in charge of such an important collection may seem unusual, but Greg Prickman, head of Special Collections, says giving students such experiences is an intrinsic part of the UI’s mission. “My hope is always that at the end of their time working with a collection and as a student at this institution, they’re going to get a job, they’re going to be qualified, and they’re going to have experience under their belt that other institutions are going to find desirable,” he says. Riordan predicts that people studying history and political science will be most interested in the collection. Among the items are correspondence from political leaders such as former Secretary of State Madeleine Albright, former Soviet Union leader Mikhail Gorbachev, and presidents dating back to Richard Nixon. Tippie College of Business professor Kay Hegarty shares some tips for this tax season. Billed as the world's first robotic quarterback, the Seeker—developed by UI alumni—may soon become a fixture on practice fields around the country.